Wendy Gunn – It is unlikely that any woman in history has ever caught more fish, larger fish or more diverse fish than Wendy Hanvold Gunn. She has set and still holds IGFA World Records for the size of her catch – she was the first woman to land a striped marlin on a fly; and in fly-casting distance competition, twice exceeding 100-feet with a 5-weight line. Wendy Gunn, a professoinal guide on the Colorado River, introduces you to fly fishing Lee's Ferry. This tailwater, just below Glenn Canyon Dam and at the start of the Grand Canyon, is one of the most beautiful places on earth to fish. Learn Wendy's secrets to catching the trophy trout that make this place their home. Gunn’s travels to achieve fly-fishing’s pinnacle look like a page from National Geographic: Australia for black marlin; New Guinea for black bass, saratoga (or spotted barramundi) and black marlin; Belize for bonefish, permit and tarpon (including two Grand Slams consisting of all three species in one day); Costa Rica for tarpon; Mexico for marlin, wahoo, roosterfish, dorado, yellowfin tuna and Pacific cubera snapper, Florida for tarpon and permit; and Alaska for rainbow trout, all five salmon species, grayling and northern pike. Wendy with her husband Terry own Lees Ferry Anglers and Cliff Dwellers Lodge in Marble Canyon, Arizona where she is general manager of operations. Lees Ferry Anglers is one of the largest fly-fishing outfitters in the world employing 14 full-time guides. Cliff Dwellers Lodge is a year-round lodge located at the base of 294,000 acre Vermilion Cliffs National Monument on the road that connects the North and South rims of the Grand Canyon. 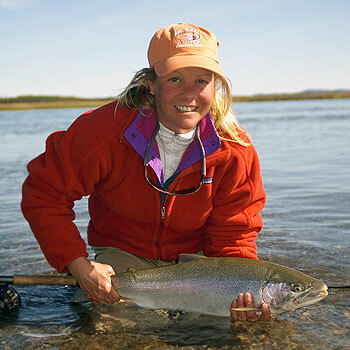 In addition to cover photos on virtually every fly-fishing magazine, Wendy has been featured on television as the series host of Fishing the West, Americas Outdoor Journal, and Fly Fish TV Magazine which has aired on FOX, OLN and The Outdoor Channel. Her two fly-fishing videos are An Introduction to Fly Fishing, and An Introduction to Fly Casting. An ardent conservationist, she is active in Trout Unlimited and other groups as well as Casting for Recovery, an organization that helps women recover from breast cancer. For more information on Wendy and Terry's guide service and fly shop, Lees Ferry Anglers, visit their web site at www.LeesFerry.com.